As markets expand and regulatory requirements evolve, the global pharmaceutical industry strives to meet them. Shipping pharmaceutical products is a no-error ball game — guidelines are there for a reason and need to be respected. But tightening them opens up a whole new scenario for pharmaceutical businesses. Companies needing to maintain their local or global cold chains for temperature-sensitive products in transit face a major issue balancing compliance with cost. So how do they go about achieving this in a more legislative environment? 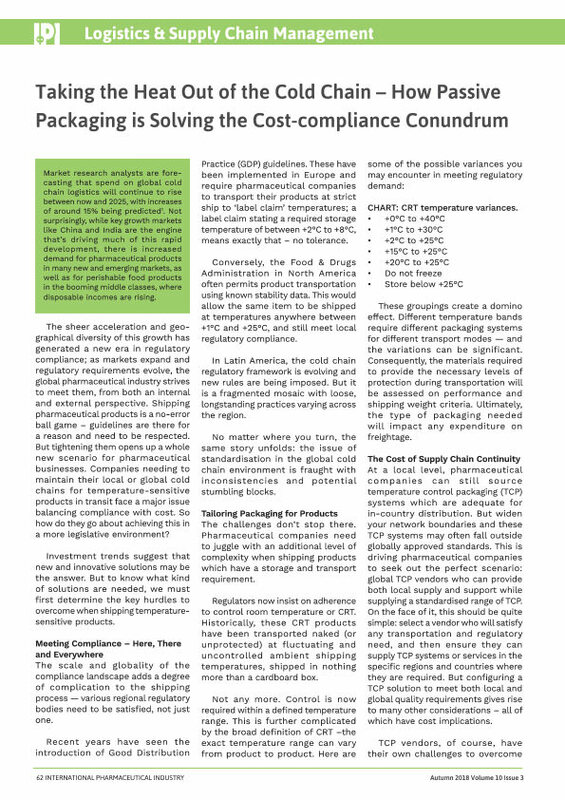 This article, published in the Autumn issue 2018 of the IPI journal, discusses the rising cost of cold chain logistics due to compliance issues and ever-increasing global regulations. Clive Bryant and Richard Wood explain how Softbox is approaching the problem with high-performance reusable shippers like AEON.